Northern Fine Scale have introduced a rake of three South Eastern & Chatham and Southern Railway panelled coaches as a load for the Wainwright "D" Class, or "C" Class locomotives. These kits are currently out of production. We would like to produce another batch during 2017 after the forthcoming 20 ton guard’s van and SUV van. Please contact your agent if you are thinking of placing an order. The rake comprises of a Composite Brake (birdcage), Tri Composite, and Luggage Brake (birdcage). 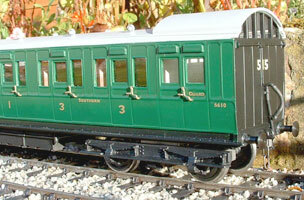 These are also available in SR livery, and are labelled with the correct working set numbers. Prototype trains ran in multiples of three, but we can supply any formation you require, with or without the birdcage ends and look very presentable in other liveries. 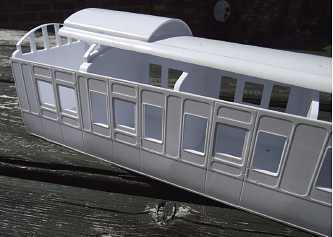 The panelled bodies are constructed from precision machined Styrene, and feature purpose-made lost wax brass castings for the handles and grab rails, correct pattern sprung buffers, torpedo roof vents, vacuum pipes, and detailed interiors. The Fox pattern bogies are fully compensated. They are supplied fully assembled including compartments to ensure rigidity and squareness with the elliptical roof fitted but not glued. Everything, with the exception of adhesive, paint and transfers, is included in this kit.